Labeled “Academic Acropolis” because it sits on one of the highest natural points in Manhattan and contains numerous academic institutions such as Columbia University, Teachers College, Barnard College, the Manhattan School of Music, Union Theological Seminary in the City of New York, Jewish Theological Seminary of America, Bank Street College of Education, and St. Luke's Hospital, the neighborhood is also referred to as a "college town" within New York and is adorned with all the presumable amenities. Morningside Heights is a part of "Greater Harlem" with boundaries at 110th Street on the south (sometimes stretched to 106th Street), Riverside Drive on the west, 125th Street on the north, and Morningside Drive to the east. Tucked among the neighborhood's many Columbia-affiliated buildings used to house students are co-ops, condos and rentals. The stock is mostly prewar. Riverside Drive is lined with luxury apartment buildings and some town houses. New developments are also joining the scene. 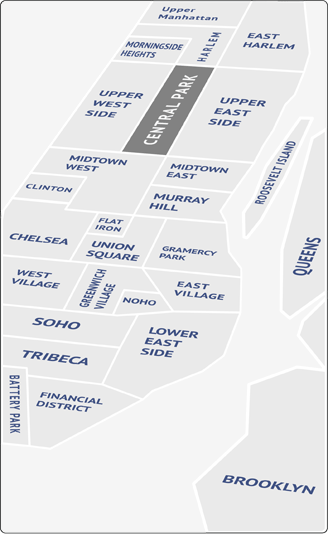 Compared to the rest of the Upper West Side, Morningside Heights seems quite reasonable. You may even find some bargains in the rough. Tom's Diner of “Seinfeld” fame is still one of the most popular. Treat the family to an organic breakfast at Community Food and Juice. Enjoy an abundant real American dinner at Dinosaur Bar B Q. You can also have a beer, a burger and a chat with at Columbia philosophy professor while watching the Mets at Toast. Part of Columbia University, Miller Theater warrants distinct recognition for its roster of world-class musical performers. Otherwise wander down to the Upper West Side or up to Harlem for a wide variety of art, culture and entertainment. In addition to Central Park, one can walk the grounds of landmarks such as the Cathedral Church of Saint John the Divine, Grant's Tomb, Riverside Church, or enjoy all of the conveniences of Riverside Park.